After the November 11, 1918, armistice the Inter-Allied Commission of Control insisted that the German troops remain in the Baltic countries to prevent the region from being re-occupied by the Red Army. As the Soviet westward offensive of 1918–1919 approached, the Provisional Government of Latvia approached August Winnig, the German attorney in the Baltics, and signed an agreement with him authorising the organisation of land defense forces on 7 December 1918. The parties signed another agreement on 29 December which secured all foreign soldiers, who participated in the battles for the freedom of Latvia, full citizenship of Latvia. The arms, horse harness and uniforms were to be supplied by the state of Germany. The food supplies were to be taken care of by the Provisional Government of Latvia. In late February 1919 only the seaport of Liepāja (Libau) and surroundings remained in the hands of the German and Latvian forces. In February and March 1919, the Landeswehr was able to win a series of victories over the Red Army, first occupying the port of Ventspils (Windau), and then advancing south and east towards Riga. The murder of three men of the Baltische Landeswehr led to the coup d'état of April 16, 1919, by the proclamation of the Government of a Lutheran clergyman, Andrievs Niedra. Parleys, in which the United States and the United Kingdom took part, did not prevent the advance on Riga and the capture of this city on May 22, where Baron Hans von Manteuffel made an entry with a small detachment, and died leading his men. Latvian national government was deposed while the Freikorps moved on to capture Riga on May 23, 1919. Latvians sought assistance from the Estonian Army which had been occupying Northern Latvia since earlier that year. After the Bolsheviks had been driven out from most of Latvia, the Allies ordered the German government to withdraw its troops from the Baltic region. However, the Germans succeeded in negotiating a postponement, arguing that this would have given the Bolsheviks a free hand. 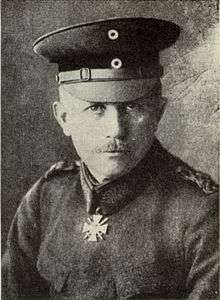 In June 1919, General von der Goltz ordered his troops not to advance east against the Red Army, as the Allies had been expecting, but north, against the Estonians. On June 19, the Landeswehr launched an attack to capture areas around Cēsis (Wenden), however in the battles over the following few days they were defeated by the Estonian 3rd Division, including the Latvian 2nd Cesis regiment, led by Ernst Põdder. On the morning of June 23, the Germans began a general retreat toward Riga. The Allies again insisted that the Germans withdraw their remaining troops from Latvia and intervened to impose a ceasefire between the Estonians and the Landeswehr when the Estonians were about to march into Riga. In the meantime, an Allied mission composed of British troops under General Sir Hubert de la Poer Gough had arrived in the Baltic with the task of clearing the Germans from the region and organizing native armies for the Baltic States. To ensure its return to Latvian control, the Baltische Landeswehr was placed under British authority. 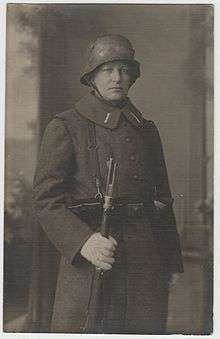 The Germans released from the Baltische Landeswehr were incorporated into the Deutsche Legion in September 1919. The legion served under the West Russian Volunteer Army commanded by Colonel Prince Pavel Bermondt-Avalov in his attempt to capture Riga, but suffered complete defeat by the end of November 1919. 1 2 3 Colonel Jaan Maide (1933). Ülevaade Eesti Vabadussõjast (1918–1920) (Overview on Estonian War of Independence) (in Estonian). 1 2 3 Die Baltische Landeswehr im Befreiungskampf gegen den Bolschewismus: ein Gedenkbuch. Riga: Ernst Plates. 1939.